The Canadian Real Estate Association (CREA) is taking over Data Distribution Facility syndication services for its members. Until now, DDF services have been provided as a complimentary service by Point2. So what does this mean? CREA is the realtor-funded organization that controls MLS.ca & Realtor.ca. Point2 is a business that operates its own syndication network and offers associated services to agents. Those most impacted by this change are the existing listing portal sites. They’ve needed to adapt their systems from integrating with Point2 to integrating with CREA. Both organizations maintain there is no difference to consumers. I respectfully disagree. So what makes this so game-changing? Most notably, CREA has opened the door for listing portal sites to distribute listings. According to CREA, five new sites will be available with more added in the future. They declined to list the sites. Listing portal sites need to meet CREA’s criteria to participate. Agents now have more sites to syndicate their listings and consumers have more options for comparing property listings. This represents an incredible opportunity for innovators to create integrated platforms. SnapUpRealEstate.ca is one such integrated listing platform. Snap Up already allows property managers to syndicate their rental listings using RentSync. The DDF syndication with CREA completes the ‘for sale’ market integration. While talking to real estate agents, I discovered many did not know about the changes CREA is making to its syndication platform. In fact, most agents didn’t realize they could syndicate their listings using CREA. They thought agents had to be paying subscribers of a company such as Point2 or that they needed a website provided by a company able to syndicate listings. To utilize CREA’s free syndication for realtors, members can log in to their CREA dashboard and select the listing portals to which they want to syndicate their listings. There are also five new options including profiles of all the syndicates. Basically, syndication means redistribution of content. The original publisher increases its reach by broadcasting its content through authorized syndicates. CREA and its members are the original publisher of listings and authorized third-party listing portals are the syndicates. CREA ensures the participating listing portals comply with its standards for displaying listings and reporting listing views. When a potential buyer inquires on a listing, the listing agent receives that inquiry. 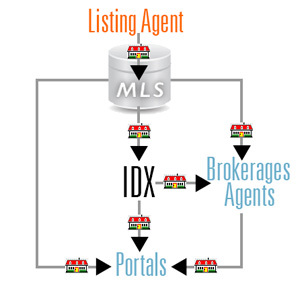 By choosing to distribute listings, brokers and agents are able to automate the process of reposting their listings or advertising their listings on other listing portal sites. With CREA, members can pick and choose on which participating websites they want their listings to appear at no cost, providing free advertising for brokers, agents, and their clients. Using the magic of the internet, CREA’s DDF will enables agents to publish listings on several different sites at the same time. CREA has vetted and signed agreements with select Canadian listing portals to establish credible options and nation-wide reach for their members. Dave Zirnhelt is the founder and CEO of Snap Up Real Estate.